I felt some compassion for George Bush when I heard he declined Obama’s invitation to join him at the WTC tomorrow. The man is a little bitter and has had enough. And maybe that’s the price you pay for the economy and getting us into Iraq, (and eroding our freedom and privacy and really, I could go on) but still. To go from standing in the rubble with a bullhorn vowing revenge, to where he is today, not even being able to show up. Oh how the mighty have fallen, as they say. I am not one to revel in anyone’s downfall, however. Maybe someday he will manage a dignified return. Nixon did. When I sent my camera to be fixed I asked them to check the focus, because for a long time I had trouble getting the pictures to be sharp. Well, they found something and fixed it and man what a difference. 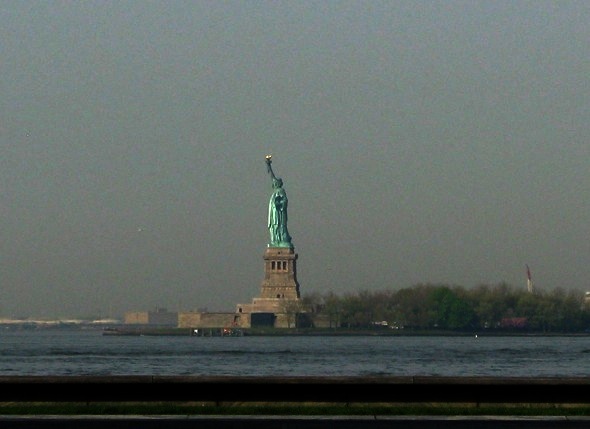 Look how sharp the Statue of Liberty is! And that’s I don’t know how far away, but it’s far! Hi Stacy, oddly enough, President Clinton was also invited to stand with President Obama at this event, but he refused, citing scheduling difficulties. I find it odd that both ex-Presidents want to stay as far away from President Obama as they can during this appearance. Particularly when one realizes that President Bush will be at the commemoration ceremonies for the 10th anniversary of 9/11. In my experience, important politicians only distance themselves from an appearance when for some reason they feel it will either lend their support to someone they don’t want supported, or become a trap that will associate them with an event when things begin to unravel. I’m sure there’s a few more possibilities. It was a beautiful event, from my tv vantage point anyway. I watched all the faces of the first responders and families, and ate up every word that they said. It was a good day here. I don’t see it as bitter, I think GWB is just following what Bush Sr. did: once out of office, don’t get pulled back into the political fray. Like him or not, GWB has actually been pretty good about acknowledging that there’s only one POTUS at a time, and that the guy in office is the one calling the shots. I think his being there would have been seen as trying to hoard some credit, and would have just been a distraction. This was Obama’s moment, and justifiably so. Oh, good point. He was being gracious. I thought only Obama should have been there. It was a very touching event in its simplicity and privacy. I kept my cheers to myself when I heard the news and relished the feeling of relief and pride and hoped for additional healing. I was glued to the tv watching, I thought it was perfection. I agree with you about the simplicity of the whole thing.